4 - 5.............Candy van't Smeulveen. 4 - 5.............Athene von Nymphenburg. 5 - 5.............Don Dayan vom Franckenhorst. Kiatasee Case gained her Schutzhund I and FH tracking tiltle. 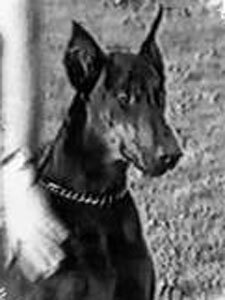 Her sire, Hundesport Ali, gained his Schutzhund III tiltle and played an important role in establishing some of Australia's best working Dobermanns.